The cross design is modeled after the Danish flag. The color red is said to symbolize the island's active volcanoes; white the ice and snow that covers most of the country, and blue is symbolic of the surrounding Atlantic Ocean. 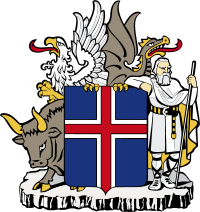 Iceland's coat of arms consists of the four protectors of Iceland (the bull, the eagle, the dragon, and the rock giant) holding onto a blue shield similar to the Icelandic flag. 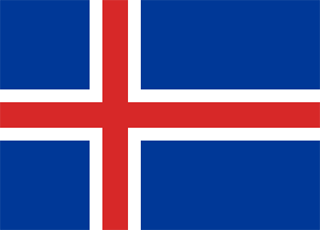 The national anthem of Iceland is Lofsöngur (Hymn). It has the alternate title of Ó Guð vors lands (O, God of Our Land). Only the first stanza of the anthem is usually sung, but it was written and composed with three stanzas. 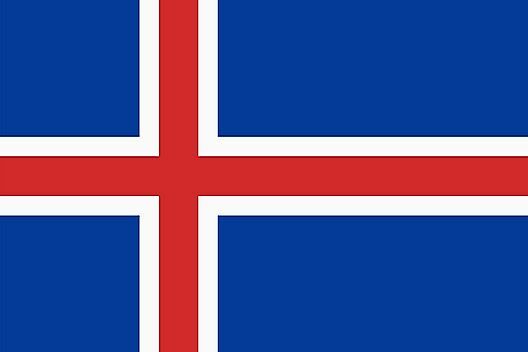 Prior to officially adopting Ó Guð vors lands as a national anthem, Icelanders would often sing Eldgamla Ísafold by Bjarni Thorarensen instead. However, Eldgamla Ísafold was set to the tune of Britain's national anthem and had lyrics that were anti-Danish. When sovereignty in Iceland was proclaimed in 1918, Ó Guð vors lands was played as the national anthem. It was originally written for the commemoration of the 1000th year of Iceland's first settlers, the Norse. By decree of the Bishop of Iceland, all masses during the nationwide celebrations should have sermons from Psalm 90, verses l-4 and 12-17. The text from the verses inspired Rev. Matthías Jochumsson to write the lyrics to the anthem while he was spending the winter of 1873-1874 in Britain. He then travelled to Scotland to meet with Sveinbjörn Sveinbjörnsson, the first native Icelander to have a career in music. The song's music was partly composed in 15 London Street in Edinburgh, Scotland as Sveinbjörn Sveinbjörnsson was living and working there at the time. To commemorate this, a memorial plaque is placed outside the house on London Street. The anthem's first performance was on August 2nd, 1874 at the Reykjavík Cathedral. King Christian IX of Denmark was present during the event, being the first ruling monarch to ever set foot in the country. It was also during this time that he presented Iceland with a constitution that changed their legal status as a country, something that was vocal in helping the country regain its independence.